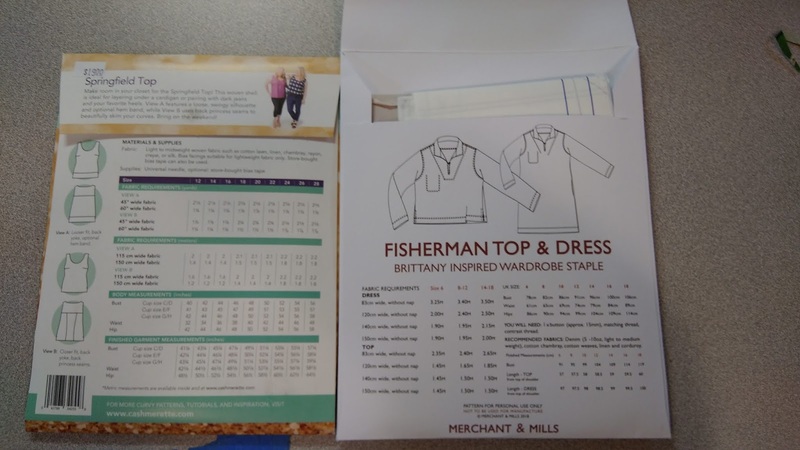 I would love to give a glowing report of the Merchant & Mills Francine top and dress, but I can't. It's not awful, it's just not very good. 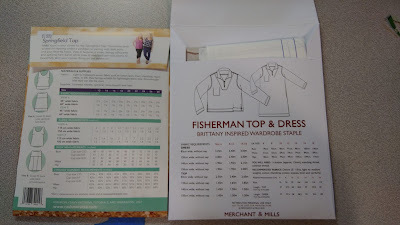 Years ago I had ordered their Trapeze dress and it suffered from the same problem, as does their Dress Shirt pattern. Low, ill fitting armholes. The shoulders in a size 16 become football player proportion, the sleeve still a tight narrow tube and the armhole is so low, that even raising your arms past your waist lifts the top and the sleeve head strangles your upper arm. Then there was that cute collar and facing that attracted me in the first place. Honestly, I have never seen something so simple so overworked. Anyway, on iteration #2 I did my own thing. Sandwiched the finished collar between facing and blouse. SO much easier. I adjusted the armholes and sleeves and still just didn't find the thing comfortable or flattering. 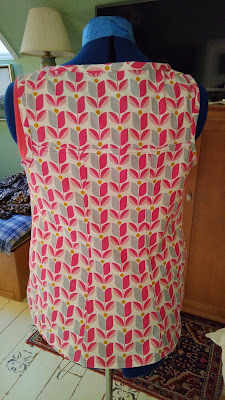 I cut the sleeves off and will just bias bind them, have a serviceable sleeveless top and be done with it. Now the Jalie Rose pattern is another story. The beauty of that pattern makes up for all the crappiness of the M&M pattern. Here is the second rendition. I had it on before I could snap pics, so this is what you got. The Cashmerette Springfield top is another winner. 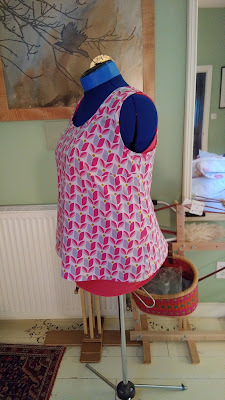 When I was putting it together I thought the neckline was going to be an utter fail. To my surprise, while it is wide, it lays beautifully and close. I opted for the shapely Version B with the back seaming and the fit was pretty darn good right out of the envelope. 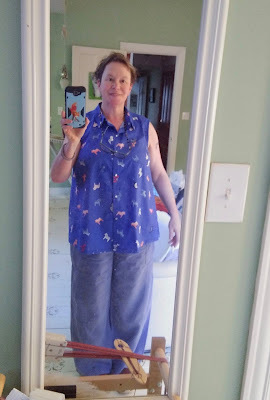 My only adjustment next go round will to bring the waist up about an inch. 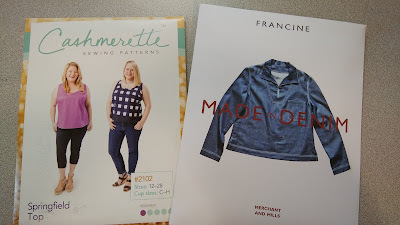 I have good luck with this pattern company and their size range and drafting is very good! I have a flock of little grey sheep now on the towels. Once that is done, we'll have some Baa Baa Black ones too! I guess I'll give them white faces. I sold the Gilmore Reel, and am awaiting the new behemoth Leclerc. Tracking says delivery tomorrow. I will start in this weekend on winding the endless blanket warp for Mongo. Who BTW got his own little piece of art as all my looms do. 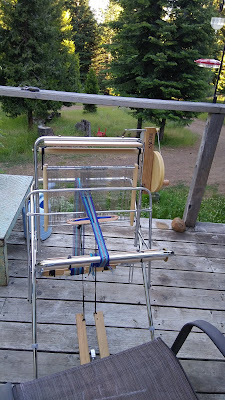 And there has been some band weaving on the deck, complete with hummingbirds buzzing around and birds chirping merrily at the feeders. 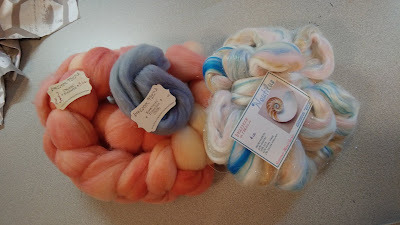 The real news is all the pretty fiber arriving for this years Tour de Fleece! I have missed the last two years due to life beyond my control, but this year I am on two teams, The Warped Weaver's Team and the Ashford team, both on Ravelry. I love this more than Spinzilla I think. There is no counting, no keeping track of yards etc., just spin and have fun every day they are riding. I love the low key aspect of that. I have one last pile of fiber to arrive. 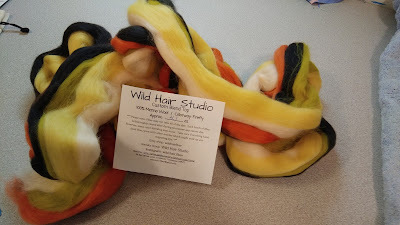 A merino/angora blend. Woot! A new one for me to try. 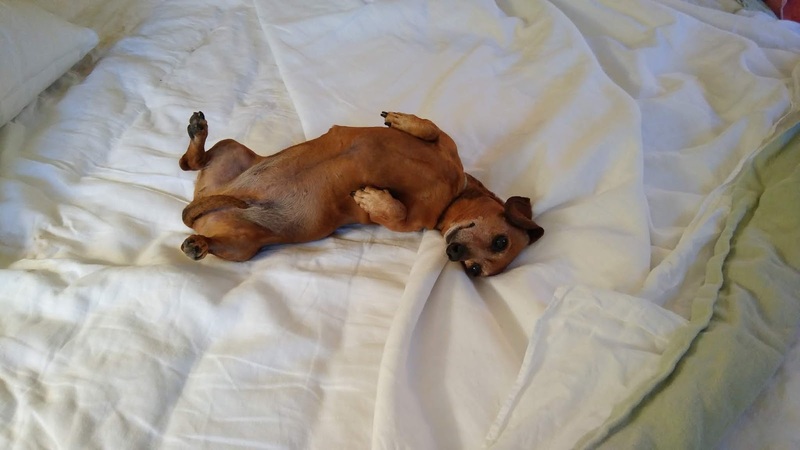 Parting shot: Miss Dachshund Calendar Girl of 2018. Now why NOT paint that black scrollwork on Mongo? It would look so classy! AW! Rub that tum! I love Spinzilla, but could never do that more than once a year. I like TdF because its for fun. I'm on two teams as well! Jenkins Spindles is doing a challenge to 'take your spindle on the road'. There are prizes for those who take pictures of spinning in different places. I'm planning a bunch of places already. My other team is Homestead Hobbyist Fiber. I like his blends and colors and the complete lack of rules, just post pics. Thanks for your reviews on the patterns. So helpful. Looks like I'll have to start lurking around on the Jalie site. They are very popular. Your mirror selfie is fabulous. I think it is the first time I have seen your face !!! Thanks for keeping up your blog. I love Your animal stories and pics , your colourful clothes and photos of your beautiful surrounds. PS Jack is still my favourite dog. There is just something about his little face. That tummy gets lots of rubs. That is her default position if she is being asked to go out. It usually ends with me picking her up and carrying her down the stairs and depositing her out the door with the rest of the dogs. Sigh, I'm so well trained. Must check that new to me fiber source! Thank you!! If I find the right stencil, I just might! Looks like some fun fiber for spinning! I had some trouble with the sleeves on my M&M top, too. Are the Brits built different????? I have seen very few good results from M&M patterns. It seems they have been drafted for bodies from another era...post-war England and have very little shaping for modern bodies using the flat pattern method and no draping samples. The Springfield top looks really flattering in comparison and ease of construction. 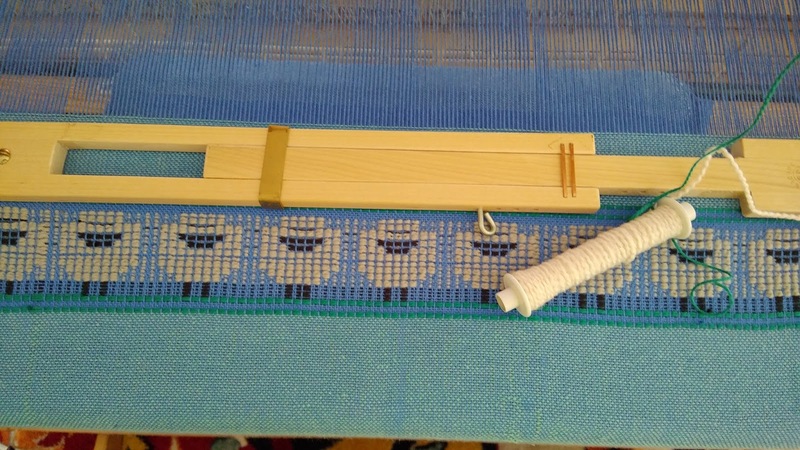 You blow my mind with all the looms! LA, Oh yes, lots of spinning goodness coming down the pike. As to the M&M pattern, it's just the drafting model they use. Colette uses one with bust darts under ones chin, Cashmerette has a beautiful thoughtful draft glowing for stylish full figure clothing. mrsmole, I have one really nice pattern from them and it has a raglan sleeve, and a nicely drafted one at that. 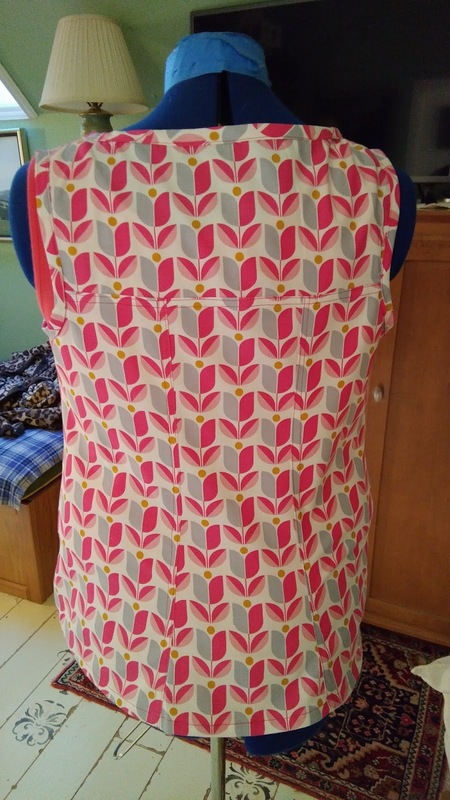 Cashmerette patterns are SO NICELY DRAFTED for fuller figures. I wish they would do more stuff for woven fabrics, but from the couple I have, I'll be splurging on woven basics from them at least. 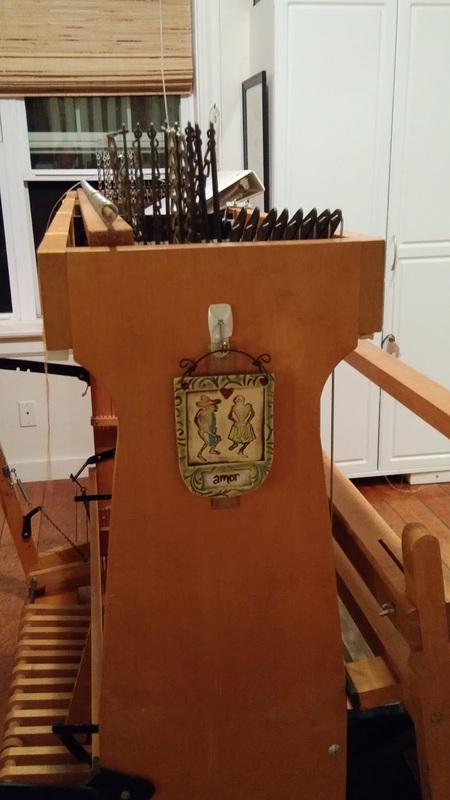 I do indeed have a lot of looms and right now, besides Mongo, they are all loaded and weaving. There you are! I can't believe how excited I was to get to see you - obviously, I need more socializing in my life. What a lovely spot to weave and I love that first roving - spinning is on my bucket list (almost as long as my to-do list, which means I have to live to well over 100), but will start with a spindle. As for that cover girl, what a demure little thing - given the position of her little tail. They do train us fairly quickly, don't they? Theresa, your pic is adorable, wet hair and all. I haven't made any M & M patterns, even from their books. I just look at the pictures and admire the photography. The clothing, meh. The Jalie and Cashmerette tops are definite keepers. You should talk to Michelle about spindling, she's an expert! Mandy is only demure when she thinks it might allow her to stay in bed. HA! But we both enjoy the cuddle time as I carry the "football" carefully down the stairs. Cookie pockets are VERY important. I'll keep an eye out for those updates! It is nice to hear that Jack and crew like all the treats they receive from me! Just wish I was there to give them pets and treats in person. And I wish you were here too for a visit. They would mob you.....I do not have a well behaved crew. That daschund calendar model is something else! As is the wool waiting to be spun. It always looks so enticing to me, but spinning? Nope. Thanks anyway. Oh Put a Rug Under It!